A new noninvasive technique objectively measures fruit and vegetable consumption, helping nutritionists and medical professionals measure and improve the diets of children and adults. A diet rich in fruit and vegetables is linked to a variety of improved health outcomes, but accurately measuring consumption by self-report, especially with children, is challenging and can be of questionable validity. But a device being developed in a collaboration that involves researchers from the Yale School of Public Health has the potential to change that. Researchers demonstrated for the first time that the device, which uses blue laser light to quickly and painlessly scan the skin of a subject’s palm, accurately measures changes in a biomarker known as skin carotenoids in response to an intervention involving a diet enriched in fruits and vegetables. In a study that appears in the American Journal of Clinical Nutrition, the researchers report that the noninvasive technique tracked skin carotenoid changes over a 28-week period that was divided into distinct dietary phases marked by high and low intake of provided fruit and vegetables along with a phase where study participants resumed their usual diets. The palm-reading device, which uses resonance Raman spectroscopy (RRS), has the potential to help nutritionists and other medical professionals measure and improve the diets of children and adults alike. 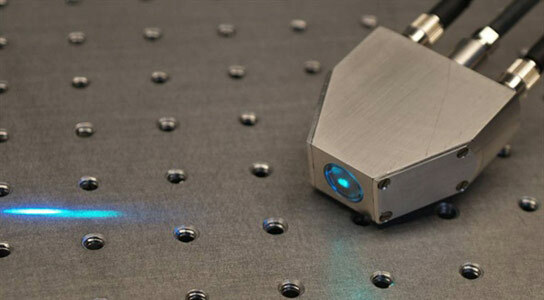 The RRS device works by measuring changes in energy levels of electrons in molecules after the laser has excited them. It consists of a flexible fiberoptic probe connected to a boxlike central machine; the probe is held against an individual’s palm for about 30 seconds while the light interacts with carotenoids in the skin. Then software on an attached laptop processes the results, which takes another 30 seconds. Diets rich in fruit and vegetables have been linked to important health outcomes, including reductions in cardiovascular disease, type 2 diabetes and some forms of cancer. But only 11 percent of the U.S. population currently meets the daily recommendations for vegetable consumption, while 20 percent meet the guideline for fruit. Subjective methods of measuring fruit and vegetable intake, such as questionnaires, are prone to bias and error. Measuring carotenoids in the blood, meanwhile, provides a highly accurate result, but the invasive process is more expensive and especially difficult with children. Brenda Cartmel, a senior research scientist and lecturer at the Yale School of Public Health, is a co-author of the paper, along with researchers from the USDA/Agricultural Research Service Grand Forks Human Nutrition Research Center, and the University of Utah. Be the first to comment on "Noninvasive Technique Measures Fruit and Vegetable Consumption"